Ever since I was a child, I have had an obsession with everything French: the language, the Eiffel Tower, the food. It all fulfills a passion in my heart. I studied French in high school and later lived in the French House at my university. I've traveled to France, and have studied classical French cooking in culinary school. It is no surprise that when Flammarion was releasing a new cookbook entitled French Bistro (available February 7th) distributed by my friends at Rizzoli, I would be first in line to check it out! The book points out all of the key elements, or commandments, in a successful French bistro. Each chapter is devoted to one: The Owner, the Chef, the Chalkboard Menu, the Wine, the Servers, the Table, the Decor, the Clients, the Ambiance, and the Aromas. Each chapter contains a subheading which further discusses the important elements of the Bistro. Some include the Bar, the Cheese Tray, Desserts, and Coffee. The Paul Bert, a famous Parisian bistro is the epicenter of the book. 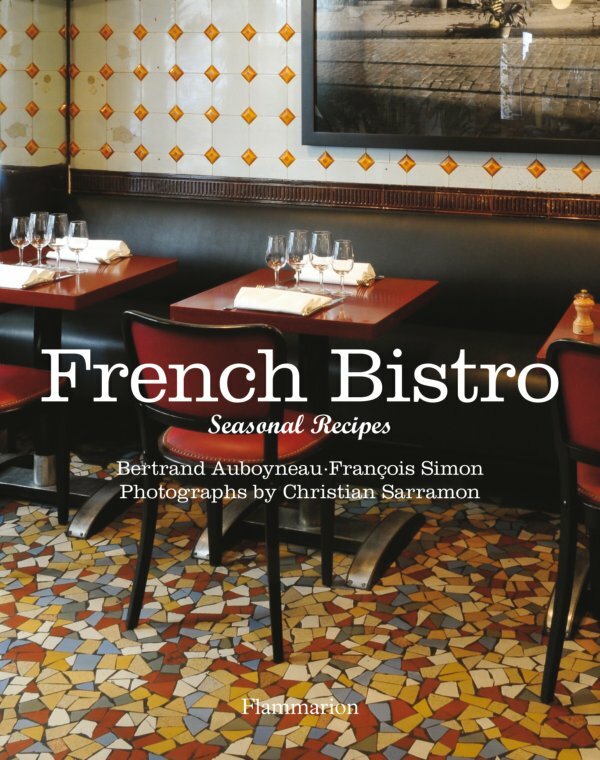 All of the recipes are from here, but several other famous Parisian bistros are also highlighted among the chapters. The recipes are not laid out in a typical course-by-course fashion. Each chapter contains several recipes that do not necessarily relate to the chapter heading. This was the one confusing element in the book, as I did not entirely understand the motivation behind the recipes selected for each chapter. There is, however, quite a variety of recipes, and they are split up into more understandable classifications in the book's index in the back. You can use this to find recipes for a particular course more easily than thumbing through the pages. The recipes are not simply for the typical bistro fare that one might see in a plethora of other French cookbooks, but rather focuses on seasonal cooking, and the ever-changing chalkboard menu, which differentiates a bistro from a restaurant, among many other factors. In addition to the recipes, the photographs are very beautiful and inviting. I can barely resist buying a ticket to Paris to visit each of the highlighted bistros myself. The book is a fun read, a unique look at French bistros. Along with the traditional, it offers a nice dose of modern gastronomical insight. For example, you may not consider Pollack Tartare with Green Apples, Japanese Vinegar, and Aged Soy Sauce to be a bistro dish, and yet its recipe is offered in this book along with many others that are equally non-traditional. I personally selected to try out the Old-Fashioned Rice Pudding with Dulce de Leche, yet another I would not expect to find in my old-school-vision of a French bistro. Overall, I think the recipes are well-written and contain notes at the end entitled "A Dash of Advice" (cute and clever). I also found that several of these footnotes discuss sustainability and ethical treatment of animals for consumption, such as veal and tuna. I respect that this information is offered, whereas many cookbooks may call for certain ingredients and neglect to point out sustainable ways of acquiring said ingredients. Kudos to Bertrand Auboyneau and Francois Simon for including these points in their book. Overall, I think French Bistro is a unique addition to my arsenal of French cookbooks. It certainly finds its place and is not overshadowed by the others (I own many French cookbooks). I would recommend it to anyone with a passion for French cooking with a less classic flair, but especially for those with a passion for France and an interest in learning more about the French Bistro experience. Parboil the rice in boiling water for 5 minutes. Drain it, return to the pan and add the milk, vanilla extract, and sugar. Bring to a boil, lower the heat and simmer for about 25 minutes with the lid slightly askew (so it doesn't boil over), stirring regularly, until the rice is tender but not mushy. Off the heat, stir in the butter, egg yolk, and 2 generous tablespoons of dulce de leche. Just before serving, garnish with another spoon of dulce de leche, if desired. Serve the rice pudding warm or chill to serve it cold. *The recipe originally called for only 1 cup of milk. I found that the rice was not softening enough and so I added more. I think the extra 1/2 cup allows the rice to cook through better and results in a less dry finished product. **Dulce de leche is a sort of milk jam from Argentina. If it is unavailable locally, cook sweetened condensed milk slowly over low heat until it is lightly caramelized.